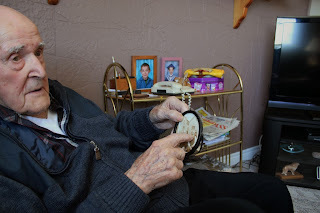 Cecil Greenland, posing in his home, six months before his 107th birthday, 2013. One of the things that I love about being a folklorist is that I frequently get to seek out elders in a community. In everyday life I rarely have the chance to meet people from older generations, but when collecting oral histories for work, it comes with the territory. Recently, I had the opportunity to meet with a centenarian who, at 106, is the oldest person I’ve ever spoken with. Interviews like this are not ones that can easily be forgotten. Cecil Greenland is personable, active, humourous and has an unbelievable memory. During our visit, he recalled for me some of his family history, and then talked about the busy life he has lead. 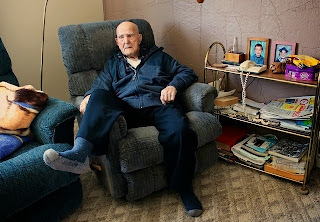 Originally from Coley’s Point, Cecil now lives with his daughter Linda in Spaniard’s Bay. While not serving as a full-time caregiver (Cecil has someone come in for that), Linda helps ensure that he remains mentally and physically active. Cecil is special for reaching such an old age, but many members of his family have lived long, productive lives too. Cecil's father and grandfather, both of whom lived long, productive lives. “My full name is Cecil Llewellyn Greenland. Now, you wonder where I got the name Llewellyn? Well, I was called after the Bishop. The Bishop baptized me, Bishop Llewellyn Jones baptized me over in St. John’s Evangelist Church in 1906. I was born on Coley’s Point--years ago you’d say Coley’s Point and they’d take it for granted it was Bay Roberts because it has always been a part of the community. I’m one of eight boys. My mother had three boys in one birth, and twins in one birth, and the only sister we had, Ethel, she died of blood poisoning when she was 12 years old. The only sister we had--the rest was all boys. Jim, my oldest brother, he’s dead. He was 98. And Arthur, he was the youngest of the boys, he was 89. And George was the school teacher--a school teacher all his lifetime--he was 99 when he died. And Isaac was 97 when he died, and I’m 106 and almost 6 months. I’m going to to try for 107 anyway, but maybe I might change my mind and go for 110." "I was 7 years old when I went to school first. You had to be 7 in order to get ins school. We had soccer, and we had a game called cricket, we had football, and we had hockey. Oh yes, I played a lot of hockey in my day, you know. I played on Bell Island, played in Carbonear, played in St. John's, Harbour Grace, Brigus. I also have four trades. I was a school teacher one time. I taught in a little settlement down in Bonavista Bay, a place called St. Chad's. An epidemic struck the little town and the department of health closed the school. ... I have been around. I've fished the Labrador--three years cod fishing and one year salmon catching. And I'm a carpenter by trade. I have my certificate as a full-fledged carpenter." During his time as a carpenter, Cecil built 18 or 19 homes, including the one he is living in now. He build his present house from start to finish when he was 80 years old. Linda was quick to acknowledge this accomplishment--when he said that he had hammered in every single nail for the house, she nodded and told me that he was speaking the truth. Even though he can no longer build houses, Cecil always takes on smaller projects and likes to spend time "puttering around" in his workshop. He seemed very pleased with his daily routine and let it be known that he won't be slowing down anytime soon. In the meantime, I look forward to helping him celebrate his 107th birthday in October of this year. Cecil talks with me about his family and the lives that they lead. Cecil's obituary can be viewed here, in the St. John's Telegram. Thank you Cecil for sharing your stories and inspiring us all to live happy, healthy, and productive lives. Am a relative of Cecil Greenland--his mother Emma was sister to my Great-Grandmother Ellen Sparkes. 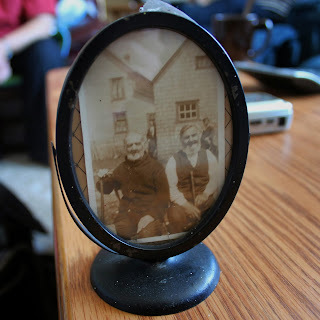 Would like to talk to you about your interview in particular the picture of his Father & Great-Grandfather?